I am a HSP and so proud to be. Although sometimes I like to just tune the World out by not answering a call or even telling people where I am going. To me that is where I grow my spirit, my mind, and strength. I get a second wind to start over again and then my ready for whatever God has for me. Oh my gosh, this describes me to a tee.My family teasingly says I cry at supermarket openings, and that is so very true. I wear my heart on my sleeve, and it’s taken me a lifetime to learn to accept myself for who I am. I owe heartfelt thanks to a very special and incredible group of women who embraced me with love and helped me to really appreciate my God-given gifts. I am indeed blessed to be part of such an amazing sisterhood. 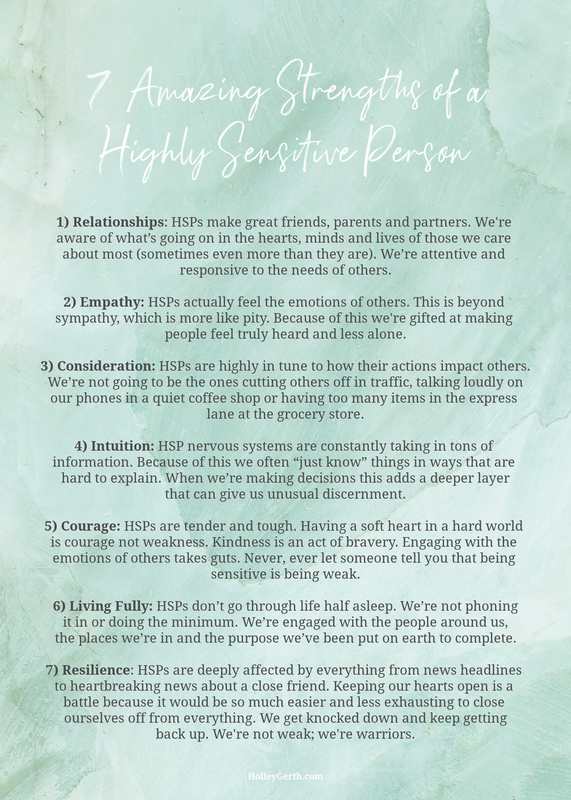 I think many people thing HSP means being overly emotional or overly sensitive about things. It does not. In fact, I’m not overly emotional but am a HSP. Crowds and large groups exhaust me. I’ve never been able to stand certain sounds (wind chimes or swings banging together). I never knew what to call it until a year or two ago. Well this is enlightening to finally have an identification. I have all of these and I was always told I was too sensitive. Shake it off. You let things bother you too much. I’ve always said God over loaded me with empathy. I feel others and nose and smells bother me. Wow. Thankful for this today. Thank you, Holley, for this eye-opening list of positives for highly-sensitive people. I’m sitting up a bit straighter knowing that sensitivity is not weakness, it’s a superpower! Hallelujah! Sometimes I feel weird/uncomfortable being too sensitive. I feel bad when I see stray malnourish dogs in Asia, I worry over a friend who has twisted hands from rheumatoid arthritis. One friend told me, “Just pray, don’t solve people’s problems” Sometimes, I overthink and care too much. Thank you for affirming HSP, Holley. So encouraged and relieved I am not just weird. Thank you, dear Holley. You are such a blessing to many. I too feel like this fits who I am, thank you Holley. HSP that I have been given gifts from God to be. Thank you Holley! I’ve always considered my being so sensitive as a weakness. From here forward, I know God has gifted me with a strength! I used to wear my heart on my sleeve. Until someone told me I was too sensitive. So I decided to disconnect. But my life got a lot worse after doing that. Here recently, I lost a friend recently, whom I barely knew, but it affected me deeply. I cried a lot thevday of the funeral. Then just last week, one of co-managers decided I wasn’t moving fast enough in job and dismissed me and took over which really hurt my feelings because I was doing my best. I got upset and cried, which surprised me…a LOT! I wonder if that was God working on me? Who knows… but I am glad I am no longer disconnected. “search”. Please post a link if possible. Thanks so much! Wow!! Thank you!! You put into words what I have been trying to explain about myself to others. I’ve know for years there was something different about me and could describe it somewhat, but you did it perfectly!! Thank you so much! I will checkout the podcast and any other resources available. I’m a highly sensitive person & I believe my hubby is also. Our biggest problem is our jobs. They are noisy with phones ringing, people needing stuff-for me telemetry (heart monitors) going off, patient bed alarms & call buttons going off. Sometimes they even play lullaby when one has a baby. All that noise just drives me nuts. On my drive home I sit alone with nothing on. Thank you for acknowledging the strengths of HSPs. At times we tend to isolate ourselves from the hectic world. My problem is I tend to take things personally. If someone says “not good enough”, “made mistake”, or anything constructive like I begin to cry because I take it personally. Hard feeling & caring deeply for others. Wearisome. Thanks for tackling a hard subject! !